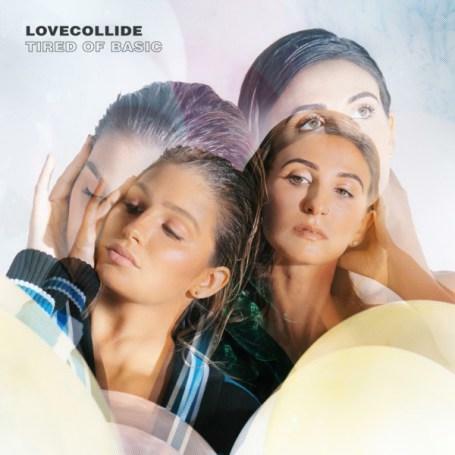 Sisters Lauren Budnick and Brooke DeLeary of the faith-forward pop duo LOVECOLLIDE independently release their third full-length album, Tired Of Basic, April 13 amidst acclaim on ABS Entertainment, LLC with global distribution through The Fuel Music. The album is available now at all major digital and streaming music providers internationally, including iTunes, Spotify, Amazon.com, Google Play and more through https://lovecollide.lnk.to/tiredofbasicIN, as well as at Target, Christianbook.com and others. With Spotify featuring the lead single from Tired of Basic, “I Don’t Want It,” on at least 15 playlists with hundreds-of-thousands of collective followers, the single and first music video from the album is also gaining radio acclaim across North America. In addition to being “New & Active” on Billboard‘s Hot AC/CHR chart and hitting Top 15 and climbing on The Hot Chart with plays at radio outlets like WAY NEW (WAY-FM Network), NGEN (Houston, TX), The Heat (New Orleans, LA), The Z (Spartanburg, SC), KXOJ2 (Tulsa, OK), BRIGHT-FM (Baltimore, MD), KPUL Pulse 101.7 (Des Moines, IA) and many more in the US, the single is being heard throughout Canada on stations like Shine FM (Alberta), UCB (Ontario), Free 100.3 FM (Saskatchewan), Life Radio (New Brunswick), 97.5 Community Radio (Nova Scotia) and many others. Along with the momentum for the single, LOVECOLLIDE is gathering features, reviews and more coverage in outlets like Charisma, Simple Grace, Upliftv, Making Your Life Count Radio, Leading Hearts, JUCE TV, Ministry in the Marketplace, Breathecast.com and more. With the new single, video and album emerging after a season filled with doubt, loss, depression and uncertainty, LOVECOLLIDE’s Tired Of Basic, produced by Riley Friesen (Family Force 5, Group 1 Crew) and Matt Dally (Superchick, Jamie Grace), is meant to be a revolution against boredom, mediocrity and status quo living. Taking the new music and messages on the road, LOVECOLLIDE continues their “Only King Forever Tour” with 7eventh Time Down, playing its hits and fan favorites at venues in Conneaut, OH (4/27), Washington Court House, OH (4/28), Marshall, MO (5/3), Pleasant Hill, IA (5/4), Leesville, LA (5/11) and more. For all the latest LOVECOLLIDE news, tour dates and more, go to: www.lovecollide.com, Facebook, Twitter, Google+, Pinterest and YouTube. About LOVECOLLIDE: Having started a band together when they were just tweens, Nashville-based LOVECOLLIDE siblings Brooke and Lauren share a passion for revival and extraordinary, bold living for Jesus. The duo first hit the Billboard charts in 2016 with the song “Mother of the Son of God” and have garnered two top-20 album nods (2014, 2016) from NewReleaseToday.com. The girls were featured in the hit movie God’s Not Dead 2 leading the song “How Great Thou Art” and in Hayley Orrantia’s music video “Strong, Sweet and Southern” while Lauren was in a Nashville TV series film trailer. Together they have also shared stages with Natalie Grant, Sidewalk Prophets, Unspoken and others, bringing their vertical driven concerts to such diverse venues as college campuses, churches, schools, retreats, conferences, camps and major Christian festivals. They have also toured throughout Canada, something that’s particularly meaningful for the girls as tribal members of the Chippewas of the Thames First Nation in Muncey, Ontario. It would be great if you would stay connected with me!! You can follow me on Twitter @DebiL1611, like me on Facebook at 2014 and Beyond, circle me on Google+, follow me on Tumblr, Instagram and Bloglovin’, subscribe on YouTube, or connect with me on LinkedIn and Pinterest. Please make sure to visit my homepage and subscribe to my blog for more great posts on running, fitness and lifestyle topics as well as food, product, music and book reviews, and more!